Leicester’s first His bundle pacemaker, a pioneering new technique, has been implanted at Leicester’s Hospitals. 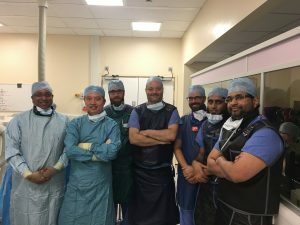 The procedure was carried out as part of the HOPE-HF clinical trial and was performed by consultant cardiologists, Professor Andre Ng from the University of Leicester and Dr Ravi Pathmanathan from Leicester’s Hospitals. The technique involves placing an extra pacemaker lead into the heart to correct the delay in onset of electrical activation within the heart. Heart failure is a serious clinical problem, which often causes severe symptoms. Cardiac Resynchronisation therapy (CRT) is a type of pacemaker therapy used in patients with the condition. However, it is only effective in patients who have a disturbance in the electrical activation of the main pumping chamber (ventricle) of the heart (‘left bundle branch block’). Some patients with heart failure have normal activation of the ventricles, but the onset of activation is delayed. This is called ‘PR interval prolongation’. These patients also have a higher risk of developing heart failure symptoms and death but do not benefit from CRT pacemakers currently. Direct His bundle pacing can correct the delay in the onset of activation of the heart and improve symptoms. Early studies have shown very promising results. The multicentre HOPE-HF clinical trial will test the new treatment in this group of patients with ‘PR interval prolongation’, who are not currently offered pacing therapy to treat their heart failure. The procedure has attracted much enthusiasm amongst the cardiology team at Glenfield, which is one of the largest cardiac centres in the UK and has been at the forefront of a number of innovations. 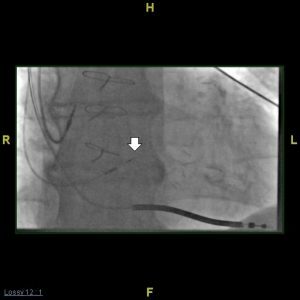 The technique to implant a His bundle pacemaker requires very little additional training and uses equipment and devices already available on the shelf. The procedure takes less time to perform than the current pacemakers (CRT) used for heart failure. In the current climate of austerity, these features add significant value to the new technique. The trial is funded by the British Heart Foundation, led by Imperial College, and being supported by Leicester’s new NIHR Biomedical Research Centre.